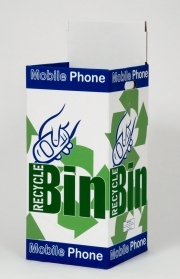 The 'Mobile Phone Recycling Bin' allows phones and chargers to be dropped through the small security hole in the top. Once full, the contents can be secured by locking down the outer security lid. The high strength double walls have integral hand holes, this enables the fully loaded bin to be lifted ready for transit. The fold down locking security lid also doubles up as a 'Header Display Card'. Product comes flat pack for storage and transportation and is easy to assemble. The 'drop out base' allows the body of the bin to be lifted away from the base when full, this eases the lifitng of heavy loads. Ideal for the recycling of Laser Printer & Inkjet Cartidges. Three individual compartments allow the separation of Cans, Plastic Bottles and Plastic Vending Cups. Optional bin liners help capture any moisture whilst prolonging the life and appearance of the bin. The patented 'drop out bottom' allows the body of the bin to be lifted from the base when full. This slimline desk recycling unit fits snugly at the end and beneath the lip of your desk, leaving minimum disruption to the ‘walk flow’ of the office. Having a waste compartment included within the recycling bank allows users to deposit all waste materials in one visit. 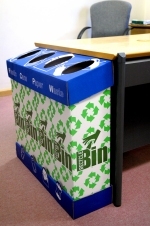 The smaller combined unit also allows more bins to be conveniently situated in an office environment, rather than having to visit more remote and (less used) larger bins. The patented ‘drop out base’ allow full loads to be accessed by lifting the body of the bin unit in an upward direction, leaving the full bin liner in base ready for removal. The re-usable bin liners (deskside liners) facilitate easy removal of the contents, whilst the see through feature allows identification of the bin contents. The current Data Protection legislation provides rules and penalties for incorrect disposal of Personal Data and/or Confidential Waste. Compliance with the Data Protection Act 1998 can provide real problems for Commerce and Business in the UK. This ‘Confidential Twin Bin’ acts as an 'interface' between the 'user' and the 'official' confidential waste bin. It was developed for two purposes, firstly to help the financial services industry comply with it’s (audited) confidential waste regulations, and secondly to help reduce the cost of confidential waste disposal. On inspection of confidential waste receptacles, some companies have found that up to 30% of bin contents was not confidential material. Conversely a recent report from the Information Commissioner's Office has found 12 High Street Banks guilty of discarding customers personal details in unsecured bins outside their premises. 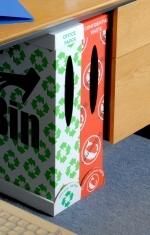 The ‘Confidential Twin Bin’ facilitates the effective separation of ‘Office Paper’ & ‘Confidential Waste’ at source. This discreet unit allows more bins to be conveniently situated in an office environment, rather than asking the office staff to visit more remote and (less used) larger receptacles. At regular intervals the bins can be decanted (swept) into a larger or more centrally located deposition points. This unit sits snugly under the desk and allows office workers to deposit both types of documentation in one location, and by allowing your office workers to separate waste at source, it ensures that the correct type paper is being deposited in the correct container. The convenience of this ‘local source’ system should lead to greater care, willingness and accuracy in the separation of office documentation. This in turn can lead to a reduction in volumes (and therefore cost) of Confidential Waste disposal. This bin is made of corrugated cardboard and comes in an attractive green colour as seen to the left. All bins are delivered in flat pack form and are easily assembled. These bins are available from as little as £6.00 + VAT per bin excluding delivery charges for quantities of 50 or more units. 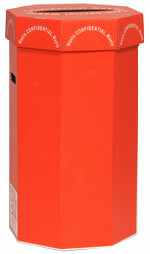 A minimum order of 5 bins is available for £65 + VAT including delivery to UK mainland. Green bin liners are available for this bin which are delivered on a roll. This bin is made of corrugated cardboard and is white in colour. All bins are delivered in flat pack form and are easily assembled. These bins are available from as little as £7.50 + VAT per bin excluding delivery charges for quantities of 50 or more units. A minimum order of 5 bins is available for £69 + VAT including delivery to UK mainland. 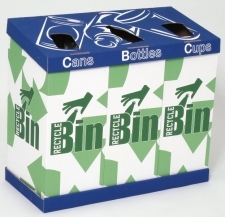 Our cardboard confidential bins are a low cost solution for any waste or recycling initiative. They are BIG and they are BOLD. We can personalise your bins by providing printed customised labels featuring your own corporate identity, logo or graphics. Clear bin liners are available for this bin, which are delivered boxed.